Breeze has over 20 years experience providing residential and commercial estate liquidation solutions with dignity and care. If you've found yourself in the position of needing to liquidate an estate in Sun City, Sun City West, Surprise, Peoria, Glendale, or the West Valley of Phoenix, BREEZE Estate Sales can help. You'll have a clean empty house and a check in your hands in no time! Hoarding situations and "packed houses" have become a specialty. Don't be embarrassed, as we have seen it all before. BREEZE Estate Sale Company also does buyouts of collections and vintage jewelry and conducts sales of personal estates and business or retail liquidations as well. We're professionals who are experienced, licensed, bonded, and do things "by the book". We have no upfront fees and provide a straight-forward contract. We work on a flat commission rate based on a value-to-labor ratio and can quickly tell you what that rate would be during an inspection of your estate items. If you're feeling overwhelmed by the life changes you're facing, call us at 623-451-0801 or visit our website at www.BreezeEstateSales.com. Our consultations are always free and If we can't help you, we'll try to suggest some other options for you to consider. Scottsdale Estate Sale by Breeze Estate Liquidations - Don't Miss This One! Gorgeous in Gilbert! Beautiful furniture and accessories. Don't miss it. 50% OFF Most Items: Sun. Apache Junction Estate Sale by Breeze on Dec. 8th 10am - 4pm. "Your team puts in some long hours and the results you get are impressive. I've never been involved in selling an estate before, but I have to say I'm surprised. I got a nice size check right away with a list of everything. I couldn't be happier." "I can't believe what has taken place in 3 short weeks. I would have never thought it would be possible and I was completely overwhelmed (as you know) with the amount of stuff that dad had accumulated over the years. "As an attorney in the Midwest, I didn't know where to begin to find an estate sale company in Arizona. A good client of mine who lived in the Phoenix area most of the year passed away suddenly and I needed to liquidate the estate from 1000 miles away. 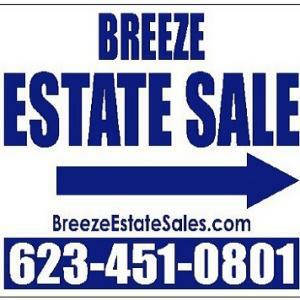 A local lawyer in the Phoenix area recommended Breeze Estate Sales. I was very impressed with their process, their detailed settlement sheet, the sale outcome, and the professionalism of this company. To put it briefly, don't think twice about hiring Breeze - their name says it all. If your experience is as good as mine, you'll be highly satisified with their integrity." Anthony Bukaty, Attorney-At-Law, Bukaty Law Offices, P.A.